2. A geometric figure formed by the revolution of a circle around the base of any of its arcs, such as the convex molding at the base of a pillar. /to·rus/ (tor´us) pl. to´ri [L.] a swelling or bulging projection. 1. A geometric figure formed by the revolution of a circle around the base of any of its arcs, such as the convex molding at the base of a pillar. 2. A rounded swelling, such as that caused by a contracting muscle. the end of the stalk, bearing the flower parts and forming the succulent fruit in POMES, e.g. apples, pears, strawberries and rosehips. (in ferns) the mass of tissue that becomes the SPORANGIUM. (in liverworts) the cup containing a GEMMA. (in algae) the swollen tip of a branch carrying the reproductive organs. a central thickened area in the BORDERED PITS of GYMNOSPERMS. 1. [TA] Rounded swelling, such as that caused by a contracting muscle. 2. Geometric figure formed by revolution of a circle around the base of any of its arcs, such as the convex molding at the base of pillar. n a bulging projection of bone. 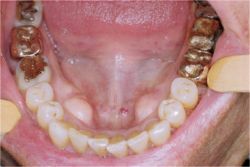 n a bony enlargement (hyperostosis) appearing unilaterally or bilaterally on the lingual aspect of the mandible in the canine-premolar region of about 7% of the population. n a bony enlargement (hyperostosis) occurring in the midline of the hard palate in about 20% of the population. pl. tori [L.] a swelling or bulging projection; a pad. chestnut on the leg of a horse; the stopper pad of a dog. Called also carpal pad. bulb of the heel in ungulates. the eminence on the dorsum of the tongue in ruminants. a fleshy protuberance at the pylorus of some species such as ruminants and pigs, that projects into the lumen of the pyloric canal. chestnut on the leg of a horse. Called also tarsal pad.